1 game for each unit. My students LOVE playing these games! Directions: you need 1 dice and 1 crayon per student. Have students get with a partner. Roll the dice, count that many spaces. If you can read the word, color that space. If you can’t read the word, wait until next turn and roll again (or help them, your choice). First person to color the last space is the winner! There is 1 game per unit. 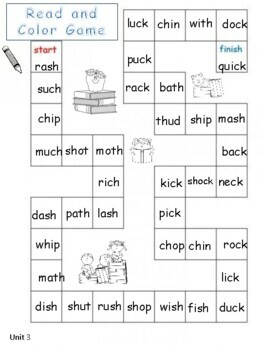 The words go along with what is being taught in Fundations level 1. 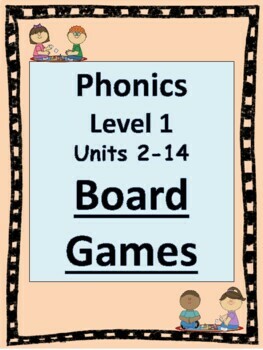 Come to my store "Reading Group" for more Fundations and reading supplements and activities! WLT Disclaimer: This product is an independent product and is not affiliated with, nor has it been authorized, sponsored, or otherwise approved by Wilson Language Training Corporation. 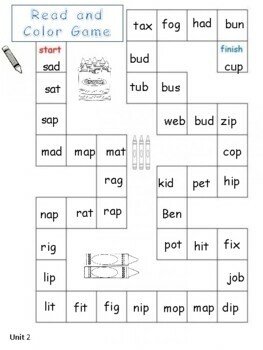 WILSON®, Wilson Reading System®, Fundations®, Just Words®, and Wilson Fluency® are trademarks and/or registered trademarks of the Wilson Language Training Corporation.